For somebody who always complains about cliches in movies, I'm improbably fond of the sports movie genre. There probably isn't a movie genre as cliched as this one. Without seeing one of these movies, you can predict the storyline and outcome with a 99 percent certainty. There is always a player or a team down on luck. In the early scenes of this movie, the player or team underperform. Then they overcome some adversity, and before you know it they are on a roll. Then towards the end something happens that puts future success in doubt, but at the end of the movie there is always success. All of my favorite sports movies play out like this, and yet I cannot get enough of the damn things. Why? Maybe it's the fact that, unlike real sports, sports movies are so predictable. When you are a fan of any sports team, ever weekend you have to face the reality that your team might lose, and hey, you know what? They might also lose the week after that, and the one after that as well. They might even keep on losing and end the season dead last, with nothing to redeem their lost season. In movies, though, there is always a moment when the luck is turned around and your heroes come out victorious. Besides which, doesn't everybody like to see themselves as an underdog? And then when you see an underdog on the big screen, achieving the impossible, this gives you a bit of hope that one day you will be victorious as well. 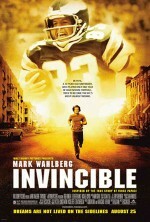 In a way, when watching movies like Invincible, you are not cheering on the movie's main character, you are cheering on your own dreams and hopes. Shock! Mr. Bean's Holiday is actually pretty funny! Mr. Bean's Holiday is one of those movies that has been on my 'to-see' pile for a loooong time. I received a review copy of it some time ago, but never really got around to watch and review it, since there were many other movies that seemed to me to be a lot more interesting. Last Saturday though, my wife told me she would like to see, so we watched it. Judging from the trailers, I thought it wouldn't be fun at all, just a rehash of the same old jokes from the television series like the first movie was, but I was pleasantly surprised. I'll say it here, probably raising the eyebrows of most my more cynically inclined friends: Mr. Bean's Holiday is a lot of fun to watch. The jokes aren't bad, even making me laugh out loud several times, the story is actually quite inspired and it has some great set pieces. I dug the scene where Bean gatecrashes the shoot of an expensive TV-commercial, really enjoyed him ruining the premiere of Willem Dafoe's Cannes movie and though some of the road trip moments were pretty inspired (especially the one where he steals the motorcycle). Heck, I even though Willem Dafoe's movie in a movie had potential! Besides that, the movie looks great, with beautiful settings that made us wish for a trip to France as soon as possible. I'm not saying they should make a third Bean movie, but this one is well worth your time. Over the weekend, I saw Hook for the first time. Which is weird. Not the fact that I saw it, more the fact that it took me this long to finally see it. At the time when it was released, which is somewhere at the end of 1991, I was a regular reader of Premiere magazine. This now sadly defunct movie magazine had a huge article about it in one of their issues, which I read with great interest. The movie seemed to push all the right buttons for me: Steven Spielberg, pirates, adventure, a new version of Peter Pan, Robin Williams... I was excited! But when the movie came to cinemas, I was too occupied to catch it, and when it came out on video, word had spread that it wasn't very good (yeah, back in those pre-internet days it took that long for word to spread. Can you imagine?). I never watched it. Not a single time. Not even when it was on television for the first time. For the second time. For the umpteentht time. What made me not watch this movie? Even though it got bad reviews, I was still intrigued by it, yet I didn't watch this movie. Not even when I became a bigger fan of the original Peter Pan story and Disney movie, and subsequently als Finding Neverland. I read about the writer of the story, JM Barrie, and I was even able to get some entertainment from Disney's 'not that good' sequel Return to Neverland. Yet, even though the movie was by this time in the shops for only a few euros, I just didn't watch it. It was like there was some sort of invisible force stopping me from catching Hook. At least until this weekend. 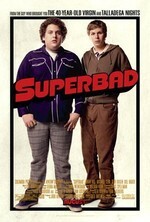 And now that I have seen it, I wonder why it took so long for me to see how good or bad this movie was. The thing is, it's not spectacularly good, but it's not spectacularly bad either. It's quite unremarkable to be honest, a sort of Goonies meets Peter Pan, without the appeal of either. I saw a user comment on IMDB, claiming this movie is 'just too American', and the writer of that comment might have a point there. I'm pretty sure that Robin Williams with an English accent would have sounded wrong, but they could have put in a little more effort to stay true to the English roots of the story. And what's with Tinkerbell talking? Isn't Disney's Tinkerbell one of the classic mute characters in movie history? I've been writing reviews for many years. I think I started sometime in high school, meaning I have been writing reviews for more than half my life. I like to think I've acquired a certain level of skill. I'm not saying I'm the best reviewer in the world, or even close to the top, but many people have told me they enjoy my reviews, and there are still magazine editors who ask me to write for them, so there must be something in my writing. I have noticed lately, however, that writing reviews is almost something I do on automatic pilot. I watch a movie, think about what I thought of it, and then drum out a review, detailing what happens in the movie (or game, or cd, or whatever), with my opinion added to the mix. Yeah, what you expect a review to be. And how most other critics also write their reviews. That is where the problem lies. You see, after writing yesterday's review of Ratatouille, and re-reading it today, I felt a little disappointed. I mean, there's nothing really wrong with the review, and I kind of like my style in praising the movie, but it's just that: a review, and nothing more. Ironically, it's in Ratatouille that the work of a critic is brilliantly dissected. As the movie's food critic Anton Ego says: "In many ways, the work of a critic is easy. We risk very little yet enjoy a position over those who offer up their work and their selves to our judgment. We thrive on negative criticism, which is fun to write and to read. But the bitter truth we critics must face is that, in the grand scheme of things, the average piece of junk is more meaningful than our criticism designating it so. But there are times when a critic truly risks something, and that is in the discovery and defense of the new." It's difficult to write a review about a movie like Ratatouille, without using words like exquisite, delicious and sumptuous. Because what Pixar has come up with this time is one of the richest animated movies ever made. The plot may not seem earth-shattering, but the execution is impeccable, making this easily the best movie I have seen so far this year. Wait, when was the last time I actually watched a movie? If you're one of the visitors who has been here since the beginning, you can remember that this site started out as a place for me to blog my reviews of the latest movies I have seen. If you have been following this blog, you will have seen it go all over the place, turning into a webcomic, a weblog about numerous different subjects, a weblog with 150 subblogs and a weblog where nothing really much was posted at all. I'd still like to think of myself as a movie buff, and when I sit in the living room of my new home, facing the couch is a nice collection of movies old and new, winking at me and going: "We're pretty cool, aren't we?" Lately though, I have noticed that there are more and more movies still wrapped in plastic lying in that cupboard, waiting to be unwrapped and watched. Because even though I have been very busy with all sorts of things lately, one of those things has not been watching movies. In fact, I think that in my new home I have so far only seen a single movie (Corina Corina with Whoopie Goldberg, which was actually quite good), and I cannot even remember what was the last movie I saw before that. I can remember the times when I used to watch a dozen movies a week, times which are not even that far away, but lately the celluloid imaginings of the world's finest moviemakers have been shown everywhere except on my television. It's not like I don't have any good movies waiting to be seen. 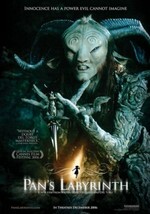 Pan's Labyrinth dropped into my mailbox at work yesterday, and I still have a few American football movies yearning to be unwrapped (We Are Marshall and Invincible), as well as the new Platinum Edition of the Jungle Book and actually about two or three dozen movies more. This is a serious situation. With every movie added to the pile, I feel a little bit more guilty. I can remember that one of my resolutions for 2007 was to not have movies 'breed' like that anymore, and to watch anything that came in within two or three weeks, so that I could store them away and not have those guilty feelings. It's not like I don't have time anymore to watch all those flicks. The moving house is done, so my wife and I have plenty of time to clear away a movie or two from the pile every night. Then again, moving house brings with it all sorts of little tasks that have to be done weeks after you think you are ready, the house is flooded with people who want to see the place, and what little time is left is wasted on videogames and bad games of football on the television. And then there is a small bookcase next to my bed, with about thirty books that are also still waiting to be read. You see, my wife and I love reading books, but we also love buying them, meaning the pile of books to be read grows quicker than any sane human being can read. 10. When the year of the challenge is over, I don't want to have a single movie or book in my collection that I haven't watched/read and consequently blogged about. So: Is it or isn't it? Is Die Hard 4.0 (known as Live Free or Die Hard in the US) as good as the previous three Die Hard movies? Does it follow the tradition with being another adrenaline packed two hours filled with explosions, one liners and John McClane yelling Yippee Ki-Yay Motherf#cker? Or did the lower rating for this movie take away all the bite, rendering the old school action hero toothless and hopelessly outdated in today's movieworld? Well, honestly, what do you think? 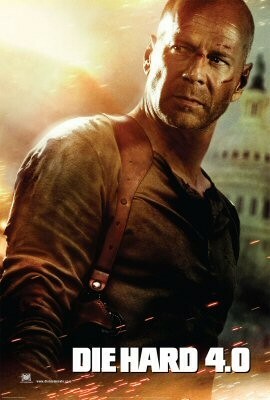 It's John McClane! And apart from him only yelling Yippee Ki-Yay M-- before being interrupted by something exploding, everything you would expect from a Die Hard movie is here. Gloriously so!